12 students, 6 schools and 1 trophy! 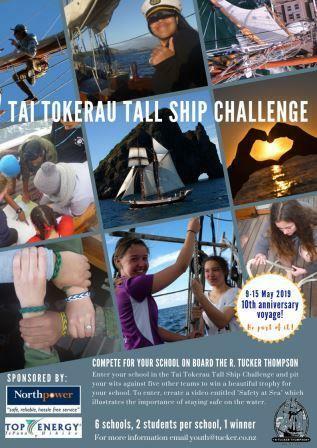 It’s the 10th year for the Taitokerau Tallship Challenge sponsored by Northpower and Top Energy and we are proud to have them as our sponsors. This is a competition to find out which school team can demonstrate they have what it takes in terms of leadership, initiative and of course teamwork. Teamwork will play an important part for the selection of the winning school, and the winning team will also demonstrate that they can work not just with the partner from their own school, but also members from other schools to complete their tasks. There will be physical hard work, some mental challenges as well as a lot of fun. Challenges set during the 7-day voyage will be based on a range of activities such as sailing, physical activity, standard of daily drills and duties, swimming as well as positive interactions between others. They will also need to demonstrate that they understand Safety at Sea and how they can work together to ensure they complete the challenges in a safe and responsible way. Only 6 schools can compete so schools wanting to enter will need to register their interest as soon as possible. For more information, or to register your school’s interest please complete the application form. The R. Tucker Thompson Trust for sponsoring Prairie and I and giving us a chance along with Northpower and Top Energy. We would also like to thank the four crew members who made this voyage so special. Captain Tim (Cappy Tim) the skipper who taught us all how to have fun – with discipline; Wayne the cook who made the greatest feeds that we all thoroughly enjoyed; James the funniest, crazy crew member who made us all smile; and Chynna the crew member we could always talk too, who was so kind to us and made sure we were always having a good time. They have all taught us so much – from every part of the boat to the history of the islands we travelled too. We participated in so many activities which all testing our knowledge, strength, problem solving ability and just how far we could push ourselves. We are really going to miss waking up early, getting into our togs and sneaking up on deck while being careful not to wake up Cappy Tim! Then jumping into the water to earn our showers. The nightly conversations at the dinner table did not leaving out any detail of ourselves, our daily adventures on islands around the coast – not to mention the maniac card games (until they were confiscated from us!). We have met such amazing and unique people we could not forget. We will really miss the “Kummies” (Dargaville High competitors) – Kase Kerr and Kyah Suckling. You guys will always have a place in our hearts. 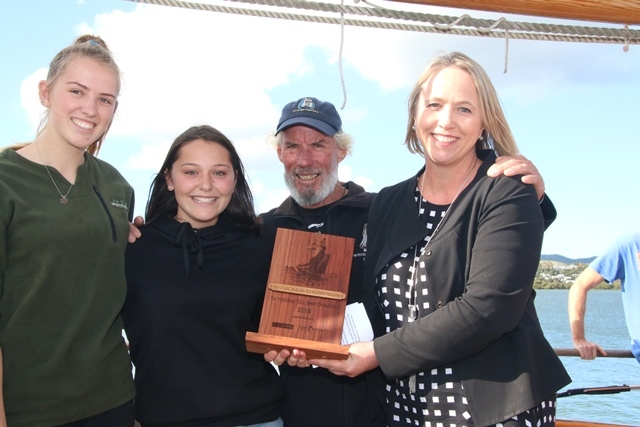 Left to right – Taipa Area School’s 2018 Te Tai Tokerau Tall Ship Sailing Challenge winners Kristy Buchanan and Prairie Herk, with R. Tucker Thompson Captain Tim Grant and Northpower Network’s General Manager Josie Boyd.